Buying a new home is like buying a new car. You can pick the exact options you want, while not worrying that a previous owner beat the crap out of it. Beware though – there’s an added price to achieve that “new home” smell (that would be paint). In the first year the builder should fix anything that breaks. Additionally, your A/C unit, water heater, and appliances should have warranties that last at least 10 years. You should not worry about big repairs for the first 10 years of home ownership. While you should not blindly pay list price, you will find that new homes have narrow room for negotiating. If you like tile floors and brown carpet, then go for it. You do not have settle for a previous owner’s orange formica countertops. New home programs are built to quickly and easily get you into the home. They will likely cover closing costs as an incentive. 1. New homes typically do not come with landscaping, blinds, or a refrigerator! This can easily add $5-10K to the cost of your home. But when you sell the home, stuff like blinds and a fridge are standard equipment. So don’t expect to get all your money back. If you are looking for a home with a fence, sprinklers, and a deck, you will get a much better deal by purchasing an older home. If you’re looking for an amazing deal, then you should avoid new homes. Home owners are more likely to accept a low offer if they need to move on. The builders will wait for a buyer that pays close to the asking price. I’ve seen new homes that do not come with light fixtures or painted walls in the garage. If you have to pay for basic items, then look elsewhere. 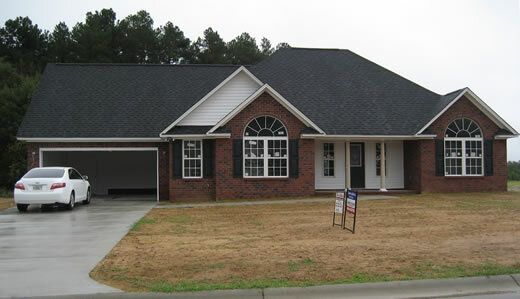 The builder may be selling at affordable prices, but you will immediately need to spend money to make the home livable. Summary – should you buy a new home? Due to the start-up costs, your smartest move financially is to purchase an older home. However, we purchased a new home at our last base and enjoyed the experience. Our home was in pristine condition the entire time we lived in it. We also have peace of mind now that we’ve rented it, knowing that things are less likely to break. Overall I see nothing wrong with purchasing a new home if you can afford it and it makes you happy.